A Discover Circuits visitor had a problem. He needed a simple on/off controller for his solar powered water pump. His system used two 12v 50 watt solar panels wired in series. 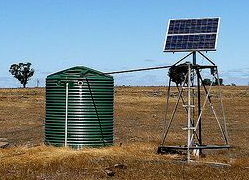 The power from the solar panels drove a submerged water pump. However, during overcast skies the pump motor did not operate properly due to the lack of power from the panel. 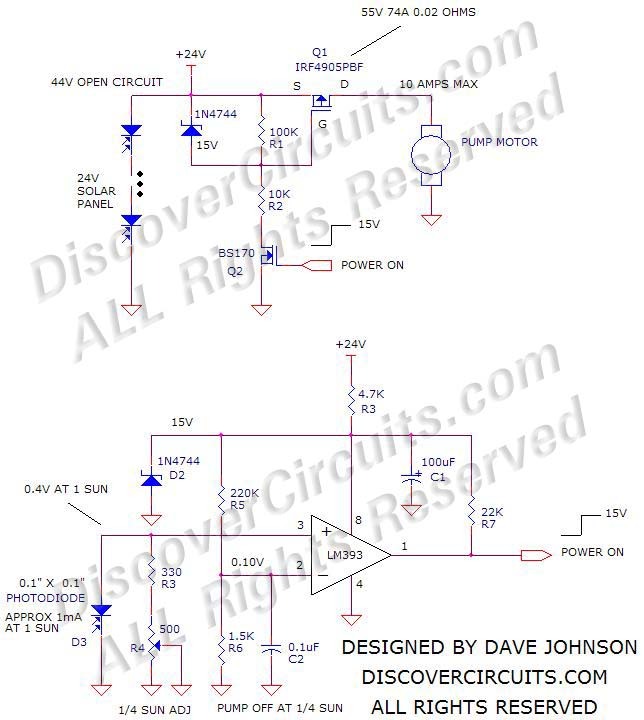 He wanted a circuit which would turn off power to the motor during low sun conditions. The circuit below performs this function. A small 0.1” x 0.1” photodiode monitors the sunlight intensity. The current from the diode is proportional to sunlight intensity. An adjustable load resistor across the diode converts the current into a voltage and feeds the to a voltage comparator circuit. The output of the comparator drives a small n-channel MOSFET, which in turn drives a high current p-channel MOSFET, controlling power to the pump motor. When the sunlight is less than one fourth of full intensity, power to the motor is turned off.